BE EQUITABLE: The peaceful protest in front of the Malaysian Palm Oil Board (MPOB) Batu Niah office yesterday. MIRI: About 100 oil palm planters staged a peaceful protest in front of Malaysian Palm Oil Board (MPOB) Batu Niah office yesterday to demand for a fair crude palm oil buying price. 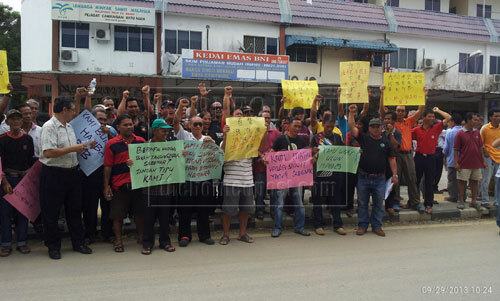 The protest by smallholding farmers from Batu Niah started at about 10.30am, and ended an hour later. Romuld Siew, a spokesperson for the protestors, told The Borneo Post that the planters were seeking non-discriminatory prices for their produce. They demanded MPOB monitor the situation in order to be fair to the planters. “We want equitable prices, according to market value,” he said. Siew claimed that since the end of last year until now, the affected planters were forced to sell their crude palm oil for between RM300 and RM350 per metric tonne even though the market value was between RM400 and RM479 (Grade A) per metric tonne. Siew said the protestors were also puzzled by the receipts of purchase. These receipts, he claimed, indicated that money was paid for Grade A crude palm oil despite buying it at a price below RM400 per metric tonne. Siew said he had gone to the MPOB office in Miri recently to voice out their problems, but no action was taken to resolve the issue. Small scale oil palm planter Jakim Ikim, 61, hoped that MPOB could help them solve their predicament. “We are not rich people. The cost of living is growing … what with the hike in fuel price and everything else. How can we support our family?” asked Jakim. He said fertilisers are now being sold at RM140 per 50kg.